I am a big fan of these crisp crusted and soft centered Kodubales. It has never happened that my guests have disapproved of this particular dish whenever I made them on special occasions. A perfect snack for winters, rainy season to sit back and enjoy with a cup of hot drink of your choice. 1. Dilute 1 cup of sour curd with 1 cup of water. Add green chilli paste and salt. Bring this mixture to boil. Add rice flour to boiling water and reduce the heat. 2.Let the rice flour cook for 3-4 mins on low heat. Switch off the stove and mix the contents. Let the flour mixture cool down. 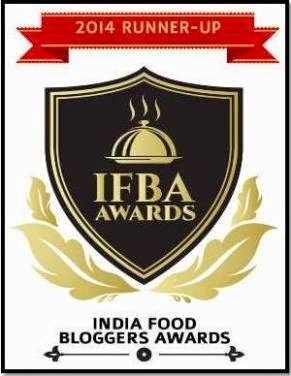 3.If you have a food porcessor fix the dough kneading blade and charge the flour mixture to the FP and let it run for few seconds or till the flour gets kneaded. It should take less than a minute. Remove the kneaded dough to a clean vessel. Alternatively you can knead the dough with your hands till you get lump free soft dough. 4. Pinch a small ball from the dough. Rub little oil to your hands and roll this dough to make long pencils. Seal the edges of this pencil to get a circle. Deep fry them in hot oil till crisp. Tip: Heat oil on medium heat to get crisp kodubales. 5. 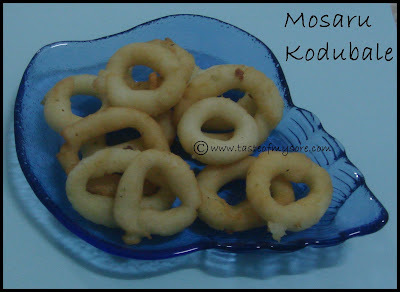 Enjoy them with coconut chutney or just plain will also taste equally good. I've always used butter for making kodbales...should try with the yogurt! Hi LG. This looks very inviting and Kodubale have been S's favorite and these look very tempting with the add of sour curds. hh! its been so long that i tasted this.will make some for this weekend.Thanks for the recipe. I just love them...one of our favorite breakfast's at home.....even i have this in my drafts...will try to post soon. I was intrigued by "mosaru" in kodubale ! Hadn't heard before. Sounds yum. Will definitely try. We are huge fan of kodubales, this is a new recipe Lakshmi. Adding mosaru gives nice taste and texture i guess. This is must try..
Wow kodubale looks soo crispy and prefect for evening snacks..
khandita ee weekend try madthene idannu. Thanks a lot for sharing. yummy..i am bookmarking this recipe..will try it soon..
happy new year, my dear. Happy New Year, LG! Congrats on your news!! Hope you are doing well. Wishing you the best in 2010! Hi, this is different type of Kodubale, Will give a try... It is also very simple to prepare.